I don't have any idea how I managed this. I had a beautifully ugly overripe banana staring me in the face, and searching through the muffin books I checked out from the library last night (not for the first time either), I managed to select a recipe to try that did not involve bananas. Which considering how easy it is to throw bananas into anything, was quite a feat. It took lot of self-restraint to keep myself from chopping up (though it was so soft it would have ended up mashed) the banana and tossing it into the batter. I just figured maybe I should give the bananas a break since it'll be a while before I make any more apple-oat muffins and maybe should branch out a bit and find another recipe I can love just as much. Though I was considering trying it with celery and allspice... but we didn't have enough yogurt, so it'll have to wait another day. But don't fear, it will be soon, because the celery in the fridge is on its way out. As for the bran muffins, they shine. And taste like bran muffins, unlike the banana-wheat muffins I usually make (they just happen to contain bran, but are not to be confused with bran muffins. Minus my mistakes (these are not meant to spill over the tops of the muffin cups, and raisins on top-they burn EASILY) that were not in the original recipe from The Ultimate Muffin Book by Bruce Weinstein and Mark Scarbrough, this recipe is a keeper. Preheat oven to 400ºF and grease muffin tins. Soak raisins in hot water for about ten minutes or until plump; drain. 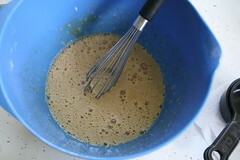 In a large bowl, whisk together flours, bran, baking soda, baking powder, salt, cinnamon, and nutmeg. 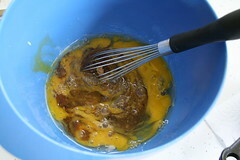 In a medium bowl, whisk together the eggs, brown sugar, and honey for about 2 minutes until smooth. Whisk in buttermilk, applesauce, oil, and vanilla extract. Add raisins. Stir liquid mixture into flour mixture until just moist. Fill muffin tins 2/3 of the way full. Bake for about 15 minutes or until browned and springs back lightly when touched in center (or the toothpick method- with a crumb or two). Remove from pan and cool on cooling rack.